10% reduction for bookings made less than 15 days in advance. 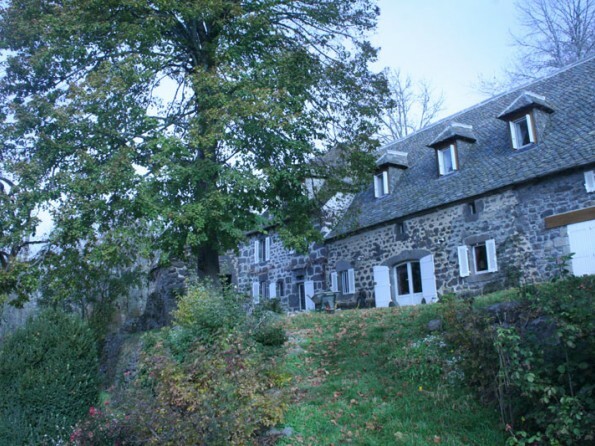 La Roche is an old stone farmstead dating from 1781, alone in a secluded valley in the unspoilt Cantal. 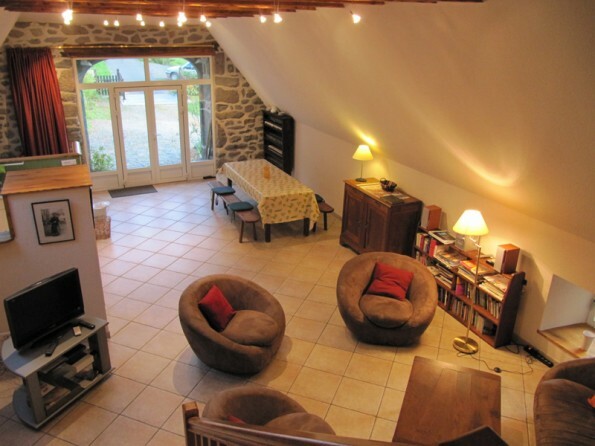 The barn has been stylishly converted into a spacious, comfortable gîte. Enjoy the pure air, the brilliant stars, and the cool nights in summer. 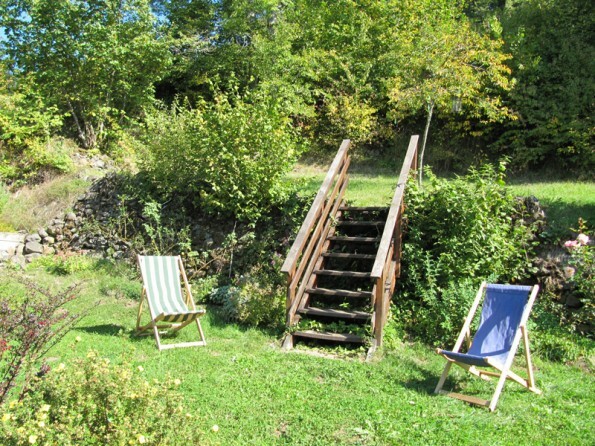 This rural retreat is only 10 minutes from good shops and services, and 30 minutes from mountains, lakes and medieval cities perched on volcanic outcrops. Nestling in a lush volcanic valley 3000 feet up, La Roche has the clearest air you are likely to find. No pollution, no other buildings in sight, just views over rolling fields and woods. If you’re looking for peace and quiet then you’ve come to the right place - on a still day you just hear the sounds of cowbells, exuberant birds and the stream below. 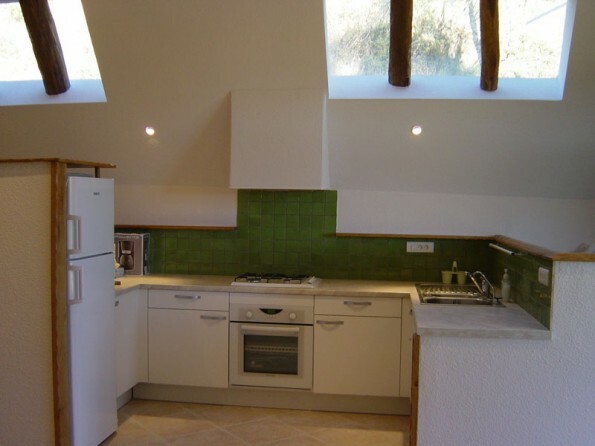 The upper hayloft of this farm has been converted into a capacious gite for 4 people, laid out over 3 floors (110 m2). The metre-thick walls are made of huge blocks of volcanic stone, and many of the original oak beams are preserved inside. With a big garden of its own it's a perfect place to escape to. 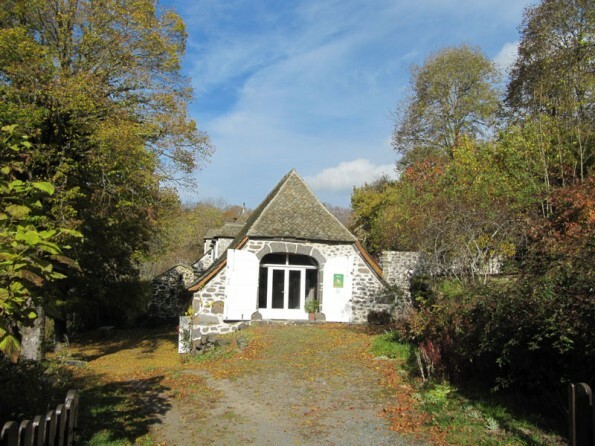 There are lovely walks starting straight from the gîte, and within a radius of 25 miles you can explore river gorges, the Cantal mountains and the Aubrac plateau. 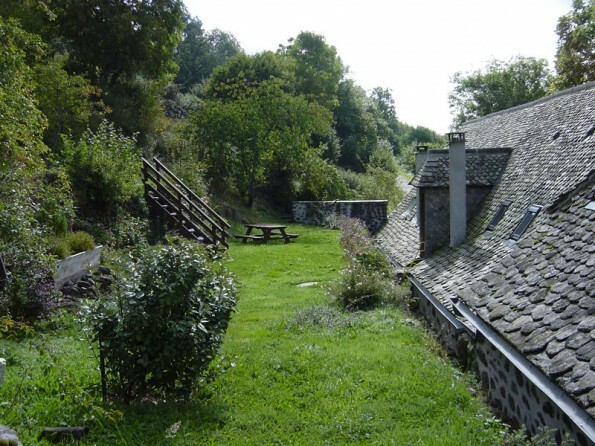 The region is especially beautiful in May and June when the high pastures are adorned with wild flowers, and in September and October when the woods are tinged with gold. La Roche is at the southern edge of a great volcanic plateau. To the north the land rises up to the Monts du Cantal, a range of extinct volcanoes peaking at 1855 metres, and snow-covered from December to April. 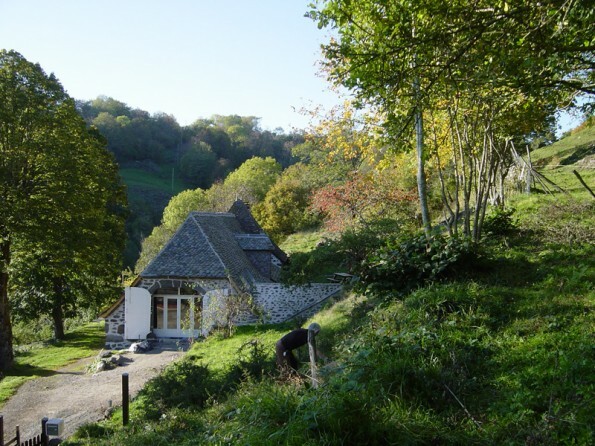 To the south of the plateau, streams tumble down through steep, thickly-wooded valleys to the great Truyère river, cutting gorges and creating waterfalls as they descend. Across the river are the high pastures of the Aubrac plateau. La Roche has a continental climate with hot summers and snowy winters. 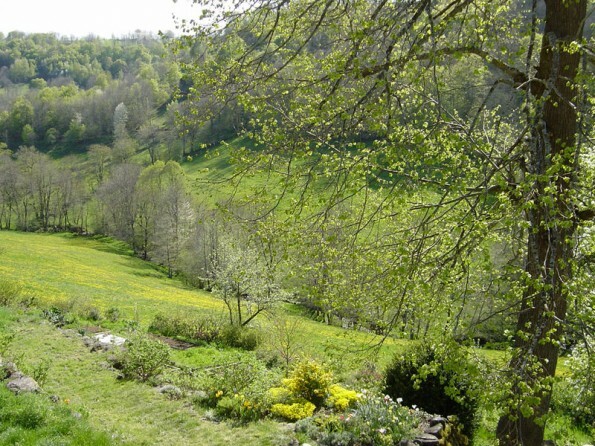 By mid-May the meadows round the gîte are full of wild flowers, and the unspoilt mountain pastures bloom with gentians, orchids, and great expanses of narcissus and rare anemones. It is wonderful country for walking, or slowly exploring by car, to visit rugged stone towns and villages with their romanesque churches and friendly markets offering delicious local produce. You need your own transport. Driving from the UK you take the A75 motorway south from Clermont-Ferrand, and La Roche is 30 minutes from exit 28. You can fly and hire a car: Ryanair has direct flights to Rodez (2 hours drive) and Limoges (3 and a half hours drive), or you can fly to Paris and take an Air-France flight to Clermont-Ferrand (one and a half hours drive). Roads in the Cantal are delightfully free of traffic, cows and tractors being the main hazard. In winter the snow-plough clears our lane daily when required. The entrance is through French doors opening into a huge living space with oak beams, a ceramic-tiled floor and under-floor heating. The kitchen is equipped for serious cooking. The dining area has a rustic farm table and benches, and an antique dresser for china. 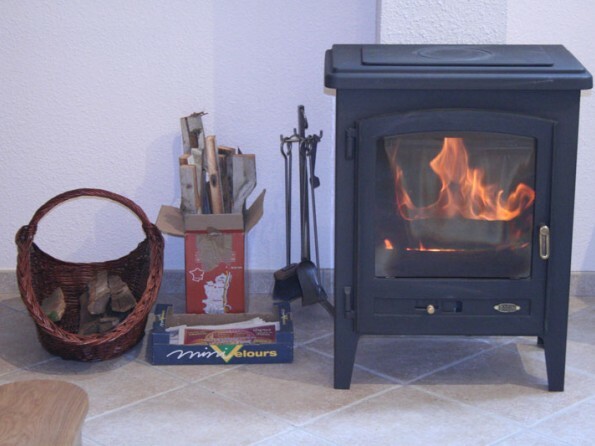 A comfortable sofa and chairs face the cosy wood-burning stove and the TV, and there is a bookcase with plenty of guidebooks, maps, board games and books for all the family. A solid-oak open staircase leads to the mezzanine level, which has two double futon-sofas for extra sleeping room, a cot, a table and chairs. You step straight through a French door into the gîte garden. 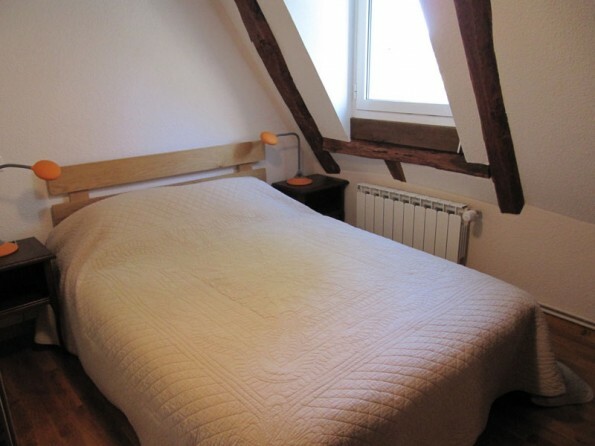 Off the corridor are two bedrooms (one double, one twin), a bathroom with WC, and a separate WC. The dormer windows in the mezzanine and bedrooms face south-west across the valley. On the lower level, reached by a spiral staircase by the front door, there is a laundry room with washing-machine and tumble dryer, and a fully-tiled shower room with WC.